HR In Mergers And Acquisitions | Business Article | MBA Skool-Study.Learn.Share. What do mergers between Daimler and Chrysler, The New York Central and Pennsylvania Railroads, Bell Atlantic and Tele-Communications and Sprint and Nexel have in common? They all failed miserably owing to the cultural clashes between the companies. The failure of USD 37-billion deal between Daimler and Chrysler could have been prevented, had the HR taken a front seat to align the American and the German cultures. Similarly, if the issues of rising costs of employees, cost-cutting and poor management had been proactively dealt with, The New York Central and Pennsylvania Railroads merger which was all right on papers, could have lasted more than 2 years. Strategic mergers and acquisitions, in order to be successful, require HR to be the key facilitators so that all the factors, besides the financial ones, could be taken into account too. Microsoft-Yahoo merger is an exemplary alliance in this regard. The merger had resulted into transfer of 400 Yahoo employees to Microsoft. The HR had a clear role as the facilitator in this transition, wherein employees from Yahoo, which has a young and fun culture, had to join fast-paced corporate culture of Microsoft. The employees from both the sides were given an opportunity to design the key elements of their new office base in Bangalore which resulted into exciting fusion of the cultures of both the companies. The new business world, which has emerged after the recent recession of 2008, has highlighted the importance of mergers and acquisitions which have become the key drivers of growth and expansion. According to a Grant Thornton report, the total value of M&A deals in India alone has crossed $16 billion mark so far in 2012. This is a special era which requires HR to play an important role along with the central characters of the top management during mergers and acquisitions, as the majority of them fail due to management, employees and culture related issues. The issues that obstruct a good deal to take place, according to Sanjay Sinha [EVP – M&A (HR), Hinduja Global Solutions Ltd.], are ‘reluctance, resentment and resistance’. These sentiments usually crop up among the employees and the middle management who face uncertainties regarding their job roles, compensation and benefit policies, new work environment and constant fear of recession during M&As. This happens when the top management keeps a tight lid over the information flow while making a deal. Although it is important to maintain confidentiality in such scenarios, however there should be a clear communication between the management and the employees regarding the future of the latter in the company. HR’s role is not limited to being a mediator between the management and employees of a company; it has to be a facilitator of the merger process between the two companies. To propagate smooth synergy of two companies, HR should be functioning proactively during the three most important phases of an M&A deal: pre-acquisition, deal-making and post-acquisition. During the pre-acquisition phase, the top HR players from both the companies should endeavour to align the culture and the organizational vision of the employees to bring in M&A readiness. This is the reason as to why Maruti Suzuki merger was successful – existence of co-leadership in all the departments, including HR. HR has dual responsibility during the deal-making phase – towards employees and coaching top leadership. HR can assist in bringing the top management together to avoid power struggles so that the top leaders merge along with their companies. At the same time, HR can help employees be a part of the deal by taking into account their opinions and also by mediating between them and the management. The post-acquisition phase calls for procedural fitments, i.e. re-alignment of all HR processes in accordance with the rules defined for the new set-up like – performance measures, rewards and recognition structure, pay scales, job roles and descriptions and positions in the hierarchy. The successful acquisition strategy model of GE Capital, the Pathfinder, works on similar lines while acquiring firms. HR performance – There is a strong correlation between the performance of HR in due diligence and the success of a deal. Better due diligence – The financial impact of people-related risks should be provided more space to be addressed at the due diligence stage. Cultural alignment – The effective cultural alignment is the key differentiator between less and very successful deals. Focus on success differentiators – Key talent retention, change management, workforce deployment and leadership alignment. M&A readiness – It emphasizes on HR improving on M&A readiness for the transition to be effective. 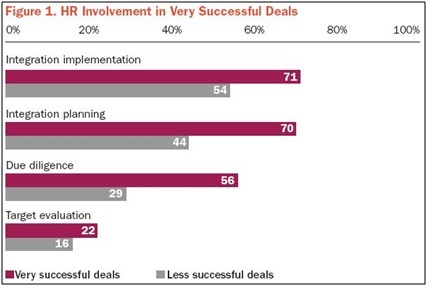 According to the study conducted by Towers Watson, the Figure 1 shows that the successful deals involve HR’s active participation in all phases of M&A, whether it is target evaluation, due diligence or implementation. However, there is ample scope for improvement in due diligence stage as many people-related risks are not accounted for while making financial analysis. This is so because risks involving people-related issues are difficult to quantify. For example, the issue of cultural misalignment, which is subjective in nature, is difficult to quantify and hence remain usually out of picture during negotiations in pre-acquisition phase. So besides Finance, HR should also be a lead function in the due diligence phase. As have been mentioned before, cultural misalignment is often the reason as to why so many great deals either don’t take off or crash hard. If the two companies involved have different best practices, work environment, hierarchies, values, vision and mission, it often leads to corporate clashes between them. Towers Watson, the global consulting firm, has also provided a way to do cultural alignment through a web-based activity – Towers Watson’s Culture Alignment Tool (CAT). It is used to effectively assess the cultural fit with other organizations by asking the leaders to rank-order defined cultural attributes that best describe their own organization. Once the existing culture of the buying organization is explicitly articulated, it can be used to develop important pointers to be discussed during the standard due diligence process. This would help to better understand the cultural expectations of the target company and the potential challenges of the prospective alignment. It would facilitate in formulating an action plan to address these cultural gaps and help the transformation to take place systematically. Another important aspect of M&A is the retention of the key talent which is important to help bring out a strong business. However, the retention of right employees is more crucial than the retention itself. If an employee’s purpose and personal values are no more aligned with the newly merged company, it is best to let go of that employee and fill the position with a right fit. Now that the HR has finally got some recognition as the change managers during M&A, it is very important that they bring about the change as effectively as possible. In order to do so, it is essential that the HR update its rule books to address the omnipresent M&A activities, as it may find itself short of tools to fight the new breed of challenges. The spotlight on HR has made it increasingly obvious that there is requirement of HR professionals who specifically specialize in dealing with the climate of change during such transition periods. Organizations looking out for M&A opportunities need to understand that HR and Finance both need to join forces to have a much greater chance in ensuring full alignment that impact deal success and organizational capabilities. And for this to happen, they need to constantly adapt and update their M&A knowledge before the next transition takes place. This article has been authored by Rahul Sharma from Delhi School of Economics.